Create a mobile application for EMT's that suits the needs of two personas: Sharon, a career-minded, small-figured, family woman, and Roland, a gentle giant who's more of a follower than a leader. AMBULAIR integrates mobile technology and semi-autonomous aerial vehicles to increase the situational and environmental awareness of active ambulance crews and assists advanced planning. We interviewed three medical professionals, one former EMT doctor and two former EMT trainees, and we consulted several emergency medical services secondary sources, including EMTlife.com, ONet, and the Bureau of Labor Statistics. We looked at current EMT-related apps on the market. We used an affinity diagram to process the information and develop themes. Among our discoveries were: (a) some feel undervalued at their job; (b) weather and road conditions can pose significant challenges; (c) there are many variables to keep track of. From this, we brainstormed over forty different ideas, which we then evaluated one-by-one on the impact versus feasibility matrix. We were most interested in the high impact-high feasibility ideas. From there, we narrowed the ideas down to four: a big data app, a performance measurement app, a fingerprint scanner that links to the patient's medical history, and an app that deploys and mans a drone. We went with 'dronebulance,' our version 1.0 of Ambulair. Ambulair suited our personas needs -- providing Roland more job security and Sharon more opportunities to demonstrate her brilliance -- and suited the overall research we saw. And, unlike some of the others, would be used more consistently and overall. Furthermore, since many people in the US already have a smart phone, Ambulair can be widely disseminated with little cost to the myriad of emergency centers, hospitals, and fire departments that make up emergency response. EMTs deploy Ambulair by unlocking the app with their thumbprint and confirming their identity, to ensure no mis-fires. Bluetooth promises dis-engagement if the phone moves outside the range of the ambulance, protecting against lost or stolen phones. 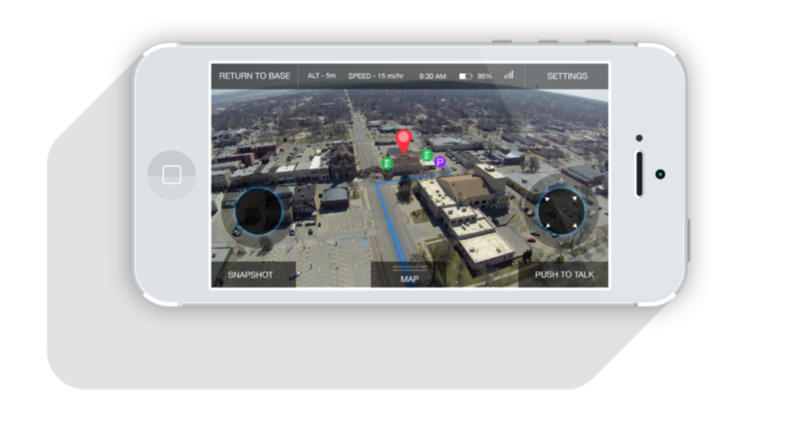 Meant to be used by the EMT in the passenger seat, the EMT can set the drone on an automatic course to the final destination using GPS, or can fly it manually, changing the route or destination, using a simple and clean interface. Depending on the need of the call, the EMT can scan his surroundings before he gets there and strategize how to best deal with the situation, relegating certain team members to specific roles, or finding a secondary entrance. Live video feed can be watched simultaneously by the command center, and recordings of the feed can be re-played to analyze scenarios. The controller of the drone can also hand off control to another teammate through a confirmation page. He can also take pictures of the scene, pull up a map and drag/drop to change the destination, and use the speaker to communicate with a patient. Furthermore, post-rescue, the EMT can tag the best access points to individual buildings. In drawing up this app, we went through several rounds of iterations, refining the interaction elements and considering user flow, privacy, and security. 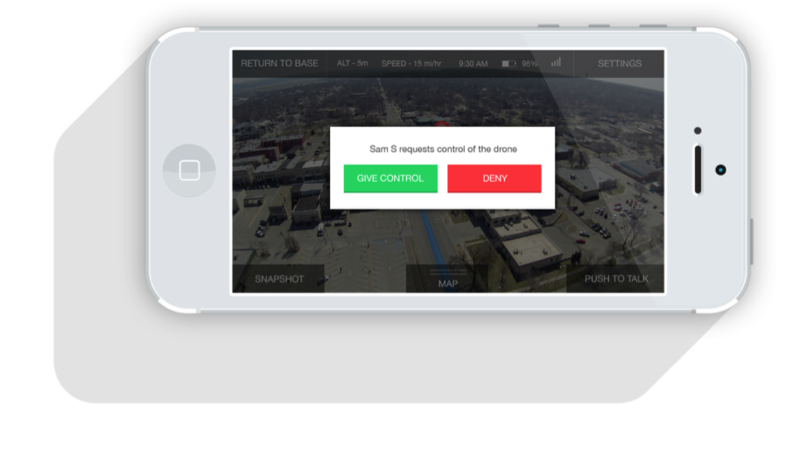 We did a survey of existing applications that could fly real or simulated drones through a mobile device or controller. Our final design is decidedly simple and constrained. Testing different ways to activate the application intentionally. Ambulair was categorized as a high-impact, moderate feasibility solution for ambulance crews. Pencil sketches emphasize overall simplicity of the user interface. The initial prototype had only three distinct screens. Wireframes focused on expanding functionality and fine-tuning interface layout to improve usability. Iterations allowed for the discovery of the best combination of color and interaction elements. We believe this app has the potential to change the emergency care industry. Through our research, we've identified interest in using technology to increase information sharing and improve coordination between EMS and hospitals. There is discussion around using Google Glass-like software to send EMS providers information about resources near their location and connect the EMS through video to a central hub, which could provide real-time information such as drug information and advanced life support protocols. Our app is well-suited to do this. By giving ambulance crews unprecedented access to their rescue locations, AMBULAIR keeps first responders current on key events at all times. Note: This project was a collaboration between myself and my talented teammates: Jimin Zheng, Linda Xu, and Prasanna Chandresekar. Prassy pulled together the final visual design for the app, and Linda was largely responsible for the design of the design specifications document.